Up-to-date requirements in NFPA 12A support safe, knowledgeable, and effective Halon 1301 fire extinguishing system inspection, maintenance, and decommissioning. Primarily present in commercial, industrial, institutional, marine, and military installations, Halon 1301 fire extinguishing systems require proper care for safety and effectiveness. 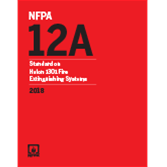 NFPA 12A: Standard on Halon 1301 Fire Extinguishing Systems presents the most advanced rules for halogenated agent systems, so equipment will function as intended throughout its service life. A critical resource for facility managers and inspectors, NFPA 12A requirements cover system design, installation, testing, inspection, approval, listing, operation, maintenance, decommissioning, and removal. Interested in other editions of NFPA 12A? Use the drop down menu above to select the edition year you need. 5.5 Determination of Halon 1301 Quantity for Total Flooding Systems. NFPA 12A sets the new standard for Halon 1301 fire extinguishing system inspection, maintenance, and decommissioning. A critical resource for facility managers and inspectors, NFPA 12A: Standard on Halon 1301 Fire Extinguishing Systems presents the most advanced rules for halogenated agent systems, so equipment will function as intended throughout its service life. NFPA 12A requirements cover system design, installation, testing, inspection, approval, listing, operation, maintenance, decommissioning, and removal. Numerous annexes provide valuable information on topics such as enclosure integrity procedure, hazards to personnel, storage containers, piping, system flow calculations, and approval of installations, along with other informational references.